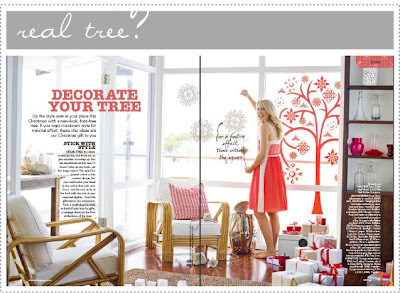 OK, I think most people, like myself, are a fan of real Christmas trees (or real "fake" trees at least) but if you have limited space or are traveling for the holidays (or even if you just want another tree in another room), then I think this tree decal idea is perfect. 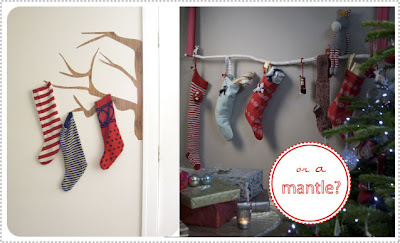 I also love these creative "mantle" solutions. If I were in a place where I could find a large, long branch, I would run out, paint it white and hang my stockings on it right now! (I also love the stockings themselves...I think I'm slightly obsessed with stockings right now...they are like pillows - you can never have too many of them. I have problems, I know). Thanks for the branch idea. My kids were just asking this morning how we were going to hang our stockings. We don't have a fireplace and I have been too stingy to buy 7 of those stocking hangers at $40 a piece. If I can just find a branch I hang hang it from the picture rails and everyone will be happy! maybe I can hang stockings from it for the girls this year. cool idea since I have no mantle or fireplace which my oldest pointed out that if Santa were to come he would have to use the door. i'm the same way. about stockings, i mean. i was on etsy forever last night looking at stockings, feeling like my current ones are completely inadequate-it's the american way, right?